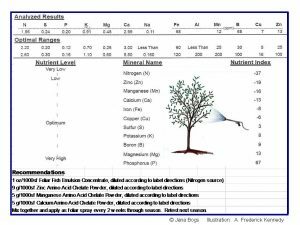 Leaf Tissue Analysis–This analysis is a laboratory procedure which determines the mineral content of a plant. It will reveal deficiencies and excesses so that an appropriate foliar spray can be designed to supply nutrients immediately to the plant. The plant can absorb nutrients directly through its leaf stomata. Foliar feeding is almost like giving an I.V. solution to the plant! Click here to order. If you would like to have plant tissue analyses performed, you’ll need to order an analysis for each plant variety because their needs will differ. The initial leaf tissue analysis with interpretation and specific recommendations for a foliar spray mix is $100. Additional leaf tissue analyses ordered at the same time are $75 each. Click here to order. You’ll be sent a leaf tissue analysis worksheet (with instructions) to fill out and send to the lab with your leaf tissue samples. Dr. Bogs will interpret the raw lab numbers and send you recommendations for foliar feeding. Soon you’ll have happy plants and the best food ever! Click here to order. Nutritional Content Analysis–This type of plant tissue analysis is used to check the nutritional content of your final food product (i.e. 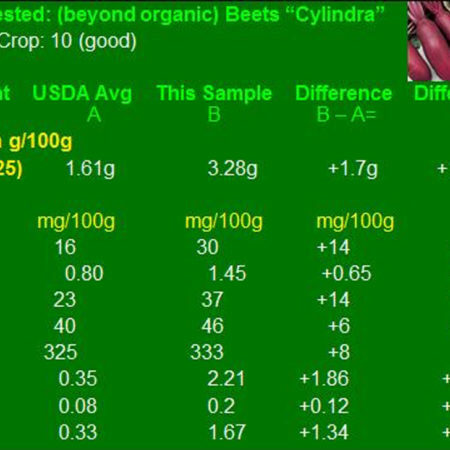 beet roots, lettuce leaves, carrot roots, apples) and compared to USDA Food Nutrient Database values. See more examples of these comparisons in Dr. Bogs’ book–Beyond Organic…Growing for Maximum Nutrition and Flavor. Click here to order book. 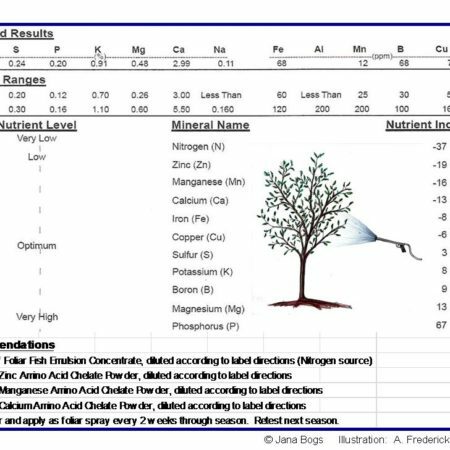 This special plant tissue analysis of your final food product includes 10 nutrients—Protein, Calcium, Iron, Magnesium, Phosphorus, Potassium, Sodium, Zinc, Copper, and Manganese. 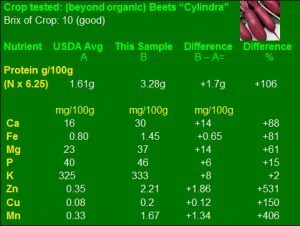 Then these values are compared to the USDA Food Nutrient Database values with calculations made showing the differences. 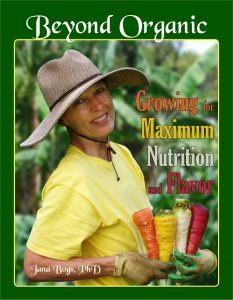 I usually see an approximate overall doubling of food nutrient content in Nutrition Grown™ crops in the first season, generally with increased amounts of nutrients most lacking in humans, such as calcium and zinc.